3cm slab Breccia Montana Quartzite shower walls & ceiling. Floor Tile: 18x18 Polished Crema Marfil marble tile. Walls. - What re the wales of the shower? Granite? Marble? What the hell is a wale?!?? When I can order or bay that blue light looks very good..
Who is the shower head by? 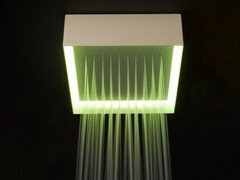 Try this site http://edezeen.com/categories/bathroom/shower-head.html for awesome led shower heads! what is the size of this shower bench? The bench measures 13" X 30"
Love it. Where can I buy the marble, & how big a space do I need? This stone is actually a quartzite, Dakota Mahogany, provided by Young Brothers. This particular space is roughly 11' tall & 6' wide. Natural stone can be fabricated to any specific size. Bookends - Are these one piece slabs on each wall or are they bookend match slabs? I like the way it looks, is it functional and easy to maintain? and the big question, is it affordable? The shower area is so webbed. Rain shower - Who makes this shower? Any ideas of Where can it be found? Beautiful!! Young Brothers provided all the natural stone & tile for this project. Is the shower bench freestanding or attached to shower wall? Thanks! Shower head - Can you please email me at silvermoon3069@aol.com where I can purchase the shower head or information about it. where can I purchase this product on Vancouver Island? what? - is that a light in the shower head? does it give off heat or anything? Shower head - Where did you get the shower head? how many cost - how many cost is it? Shower - Where can I order this?? So unique! size of shower please...thanks so much! dh72 - This shower is Amazing? Is the shower head mounted in the ceiling? shower head? - I love the lit shower head. What make / model is it? i do not see the pictures on my email do u have the right email? 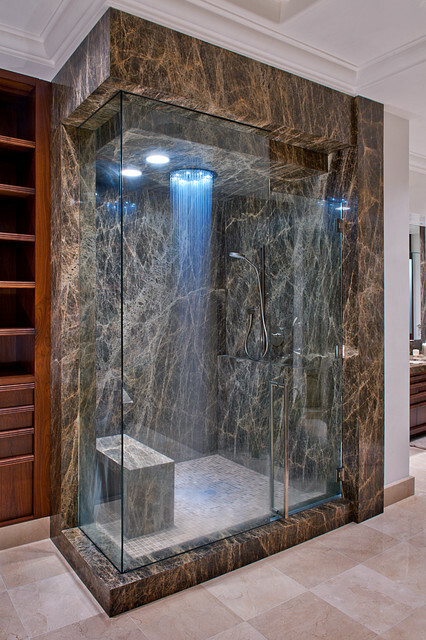 Future shower. - Can I get the specs?